Your Centerville-Washington Park Board is serious about providing the park and recreation opportunities you want. In 2015, a large sampling of residents provided us with lots of great feedback. Then in late 2016, we conducted another survey to get more of your ideas and opinions. We supplemented the survey with citizen interviews, focus groups and public meetings. Thank you to everyone who participated! 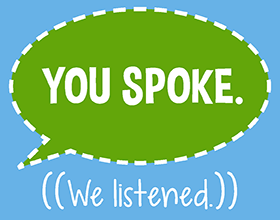 We would like to share the many improvements that are a direct result of your input. So, every two weeks for the remainder of the year we will be posting a short message about what’s been added, fixed, improved or expanded to meet your requests! In our surveys and focus groups, you reminded us that many people work during the day. (Us, too … why didn’t we think of that?) Even though daytime CWPD programs are very popular, a large group of our residents are unable to take advantage of them. In response, program staff set out to expand your evening and weekend program opportunities! If you’re looking for options to get outside and have fun with your kids, try any of the popular parent/child programs we’ve added to the evenings, like Early Adventures, Family Recess, Preschool Nature Series or one of the themed family nature programs. If you’re craving some physical activity while you’re out enjoying some of your Park District’s larger parks, now you can check out evening Trail Trekking, the Hike with CWPD series, Family Fitness, or a Saturday Family 5K Hike. Browse the fall newsletter for more information about these programs and our more traditional weekday/daytime programs. (Online registration for residents begins August 14.) We appreciate you bringing this programming deficiency to our attention and we will be tuned in to your requests as we plan future programs! Do you have an idea for other evening and weekend programs? Please send your ideas our way!